Invest in relationships, asking the Lord to fill you with His love for people, looking for opportunities to share Love and Truth. As we are investing in relationships with people, trust is developed. Hearts soften as they see that we love them. It is in the context of such relationships that we can ask spiritual questions. Once you have discovered another’s level of spiritual interest, you can follow up accordingly. Begin taking them through THE FIVE, starting with the most appropriate tool. The first step to connecting to God's Word is understanding the Gospel, which simply means Good News. There are numerous ways to express the Gospel in a meaningful way. Here you will find a number of helpful tools to understand and share the Gospel. Devos is short for "devotional". An essential part of spiritual growth is reading the Bible devotionally. A One Thing Study is a simple way to have a meaningful time in God's Word. Another key element of spiritual growth is STUDY. There are so many great tools for studying the Bible. Here you will find some great resources both for your own personal study as well as for leading a study. In Discipleship, our goal is to help students KNOW, GROW and eventually GO. When you disciple students, you are modeling for them how to disciple as well. Successful discipleship is characterized by Love (a growing relationship) and Truth (God’s Word, the Bible). 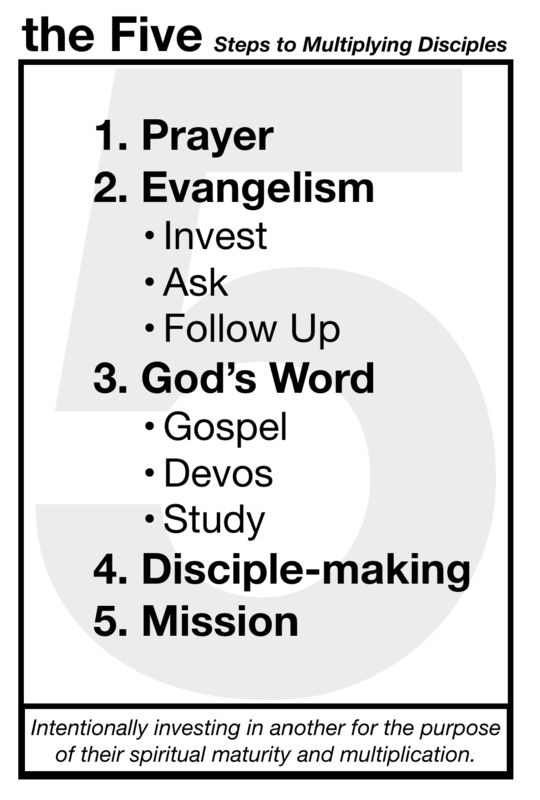 Jesus said, “Go, make disciples of all nations.” There are 6 ways that we can do that: Learn, Pray, Go, Send, Welcome, Mobilize. What is your next step in obeying the Great Commission?